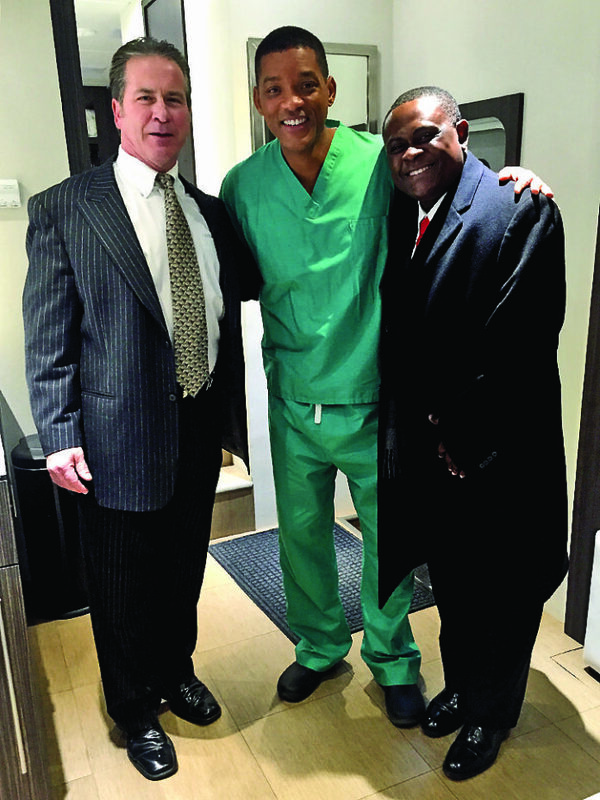 Dr. Julian Bailes Jr., left, met actor Will Smith on the set of “Concussion.” Smith portrayed Dr. Bennet Omalu, M.D., at right, in the movie. Omalu first discovered physical evidence of concussions and CTE in activities other than boxing. Bailes and Omaulu were associates at the University of Pittsburgh. Bailes was portrayed by Alec Baldwin in the movie. He’s a renowned authority on traumatic brain injuries, a neurosurgeon who operates up to 10 times a week and is a teacher of aspiring doctors at the University of Chicago. Yet for about two weeks each summer, Dr. Julian Bailes Jr. returns to Natchitoches to reconnect to his southern roots. He says he and his family visit every summer so his five children will grow up knowing their cousins, aunts, uncles and friends. Part of this week has been spent traveling to Shreveport for three of his kids to attend the David Toms Academy where they will practice their golfing techniques. On Wednesday, Bailes met with the Northwestern State football coaching staff and players to talk about sports-related injuries during Fall Media Day. One of his five children attends LSU in Baton Rouge and another is also eyeing LSU. Just more connections to Louisiana. Bailes visited the Natchitoches Times office Saturday morning to give an update on his career as a neurosurgeon and researcher. Bailes is well-known for his research into Chronic Traumatic Encephalopathy (CTE), particularly in professional football players and athletes and now, military veterans. CTE is a degenerative brain disease found in those who have suffered repetitive brain trauma. His research has been a catalyst for dramatic changes in the National Football League that includes a new helmet rule adopted by team owners in March. “The rule is well-intended but it will be very interesting to see how coaches teach it, how players adapt to it and how officials enforce it,” Bailes says. While he believes NFL owners have done much to “remake the game” for the safety of its players, he expects the new rule will create a huge controversy because of its complicated nature. “That’s going to be an interesting thing for football fans this coming season.” One of the potential medical breakthroughs that excites Bailes is the prospect of make a living diagnosis of CTE. Until now, the diagnosis has been through the examination of brains of victims. About six years ago, a study at UCLA determined that Tau, a brain protein, is a marker for CTE. Research indicates that Tau clumps with a binding agent to form patterns specific to CTE. “We knew that Tau was broken down but had no way to visualize it. A living diagnosis is the frontier of understanding, ” Bailes says. He sees the potential for treatment of CTE in the military and others with brain injuries while living, instead of after their deaths, as is now the case. Bailes also sees the potential for concussion collars that are worn by many professional football players with their use emerging among college players. The collar can limit the brain’s ability to “slosh” within the skull upon impact. It is still in the evaluation and testing stages. Bailes likens the collar to seatbelts and airbags in automobiles. The collars help the energy from impact pass through the body, lessening the impact on the brain. “I think they have promise,” Bailes says. Bailes is director of the Brain Injury Research Institute. According to the Institute website, the institute now houses more than 50 brain specimens for future research. Bailes is chairman of the Dept. of Neurosurgery at the NorthShore University HealthSystem and co-director of the NorthShore Neurological Institute. He is on the NFL Head, Neck and Spine Committee that develops safety protocol for the NFL. He was recently named “One of Chicago’s Top Neurosurgeons” by Chicago Magazine. He is also a member of the NFL Players Association Health and Safety Committee which is the players’ union. He is chairman of the medical advisory committee for Pop Warner Youth Football, the oldest and largest youth football program in the nation.